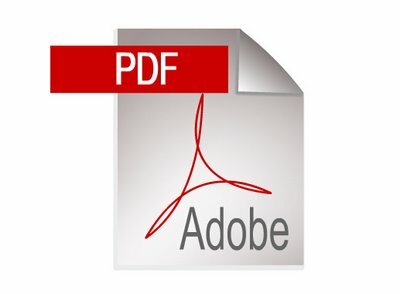 Download the PDF Fact Sheet Here! An important factor in growing and selling high-quality greens is being able to efficiently wash, cool, and dry the product. The drying step is commonly done using centrifugal force in a spinner. 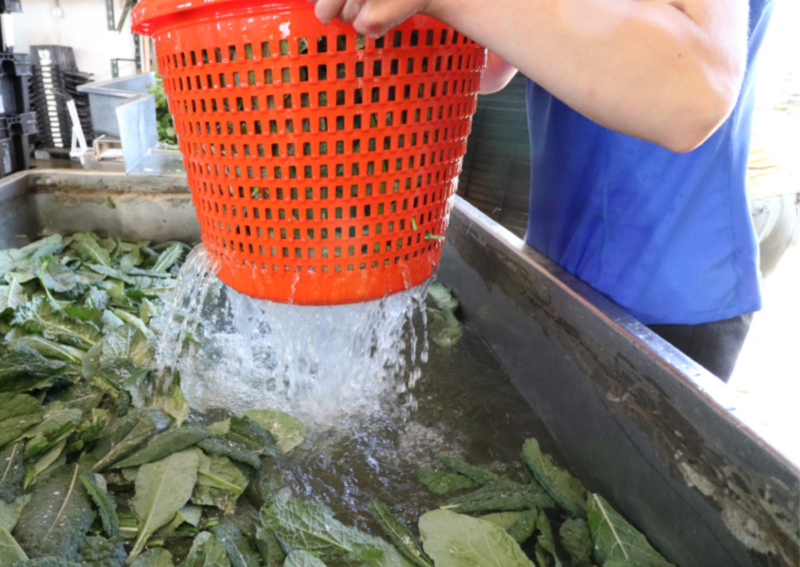 The water is spun off of the greens through a filter basket or other porous container. Some growers use mesh bags to contain the greens and improve the efficiency of loading and unloading the spinner. Some of the key features to consider when thinking about a spinner include cost, capacity, power, space and sanitary design. There is a broad range of spinners available and they vary considerably in cost. Your budget may dictate which option you choose. But, consider the other features below as well. For example, a less expensive, converted washing machine spinner may actually cost more in cleaning labor when compared to a machine designed to be cleaned. How big is each batch or how much do you need to dry in a day? Keep in mind that a 5-gallon spinner cannot adequately dry 5 gallons of greens since there needs to be room for the greens to spread out and not create an overly thick mat that water can’t get through. A rough rule of thumb is 1.1 gal of spinner volume for 1.0 lb of greens. Do you require an electric driven spinner? Can you do this step manually? Is there a significant labor efficiency or consistent quality gain in having an automatically timed spin cycle? Can you allocate the floor space for a fixed piece of equipment? Can you put it on wheels? Would several hand spinners, which could be stored on a shelf, suffice when needed? Does the spinner have a drain and how will you dispose of the grey water safely? How cleanable is the design? Are there nooks and crannies that may result in harborage of water, soil, and pathogens? Can you wash all interior surfaces well with an appropriate detergent? Can you apply an anti-microbial solution (aka sanitizer)? Will the unit be able to dry completely between uses? In the following section, a variety of manual and electric greens spinners are summarized. Manual greens spinners generally take the form of a solid outside drum, an inner mesh drum, and a lid with a spinning handle. These are typically offered in 2.5 and 5.0-gallon sizes with or without a manual brake. The 2.5-gallon spinners can accommodate the equivalent of 4 heads of lettuce (about 3.5 lbs), while the 5.0-gallon spinners accommodate the equivalent of 8 heads (4.5 lbs). The spinning handle is connected to gears that convert the handle speed to a higher basket speed. Some designs are “sealed”, meaning the drive gears are covered on the inside to make cleanup easier. Additional inner baskets can be purchased to allow for a more efficient wash/pack process. One basket can be filled while one is in the spinner and another is being packed after spinning. Some manual spinners include a drain line to direct water out of the outer drum which can save time between batches. 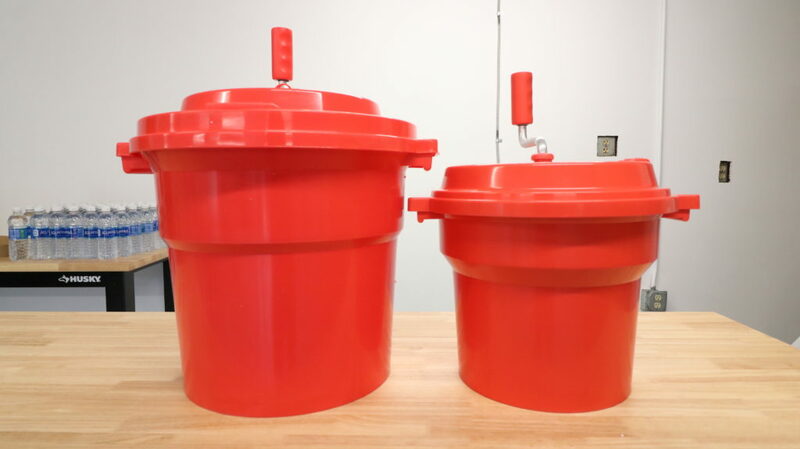 Chef Master is one brand of lower capacity, 5 (left) and 2.5 (right) gallon manual spinners common on small farms. Some farms find themselves stuck in the middle, where inexpensive, small-scale spinners cause a bottleneck, but it is hard to justify a more expensive industrial, stainless, restaurant-style machine. When you think of the physics of the job, it’s fairly simple. A washing machine has the mechanics to do it. The drum is large enough to use a 20-gallon container and has a strong electric motor to spin it at the proper speed. Washing machines are also readily available, and easy to retrofit into a simple, medium volume greens spinning machine. There are many videos on YouTube documenting this type of conversion including some from Curtis Stone and Michael Kilpatrick that cover the process. Washing machines work well for spinning greens dry but can present concerns related to food safety. 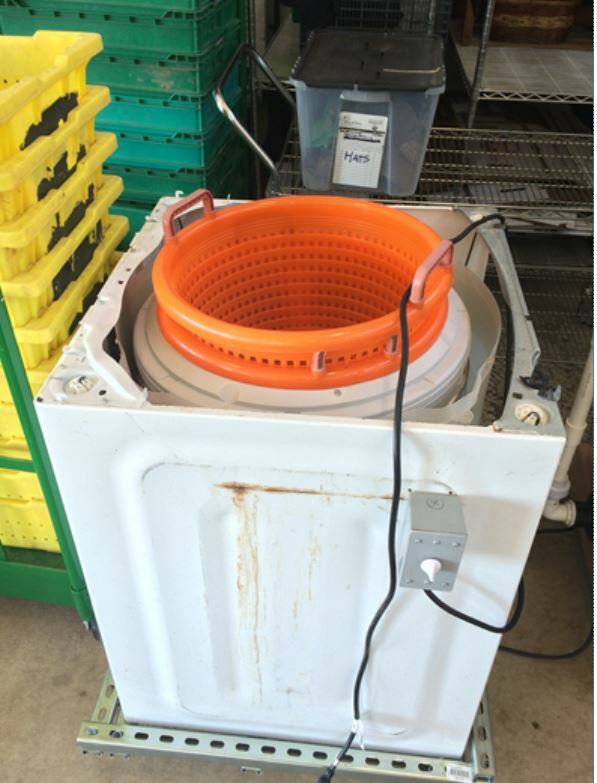 A washing machine conversion using a plastic “fish basket” as an insert and external power switch. The rule does not prohibit washing machines as greens spinners. This is where the Produce Safety Rule has built-in flexibility, supporting the adoption of safe principles but not forcing specific practices, as long as the risks can be minimized. A few key points to consider regarding washing machine spinners are summarized below. 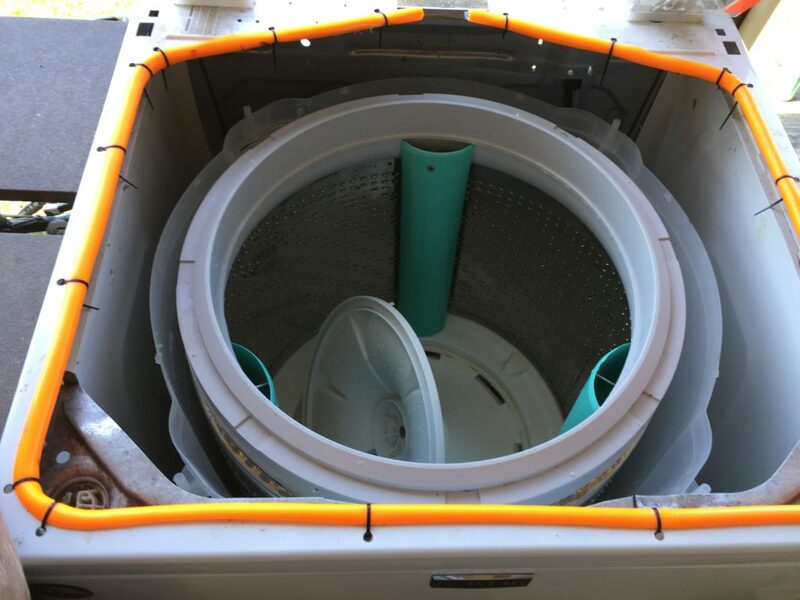 If you use a modified washing machine for drying greens, clean the drum and keep it clean. A new washing machine is more expensive, but at least you know its history. Direct the drain somewhere intentionally away from the immediate washing area and preferably into a fixed building drain. This drain should be plumbed outside of the wash/pack area, away from food production areas and bodies of water. This washing machine conversion is set up for a plastic basket insert and has used drainage pipe cut in half for additional securing. This farmer also added a split hose around the lip to cover the sharp edge. Consider removing as much of the outside paneling as possible to prevent harborage points for water and pathogens, to provide access for cleaning, and to provide for airflow to dry surfaces completely after cleaning. Bear in mind that the paneling is there to prevent access and by removing it, you may also be exposing rotating parts. Be sure you and your employees are aware of the safety risk posed by modifications and take care when operating the machine. Use a timer to limit the cycle and shut the machine down automatically when done. This prevents someone having to approach the machine while it is spinning. Also be sure to check for sharp edges and possibly break or deburr any sheet metal edges with a file if there is a chance of injury. Some growers find it helpful to put the machine on a dolly with locking wheels to allow for portability. This allows moving the machine between a storage area, a use area and possibly a separate cleaning area. Also take care to make sure electrical connections are protected from water intrusion. Consider using a basket insert instead of placing your greens directly into the washer loose or in a bag. This is an efficiency improvement by handling the greens in a container and it provides another barrier of protection from potential contamination. The removable basket becomes the primary food contact surface, not the washer. The basket is easier to maintain, clean, sanitize, and dry. Two inserts have been found by growers to work especially well due to the way they fit in the opening of the machine. 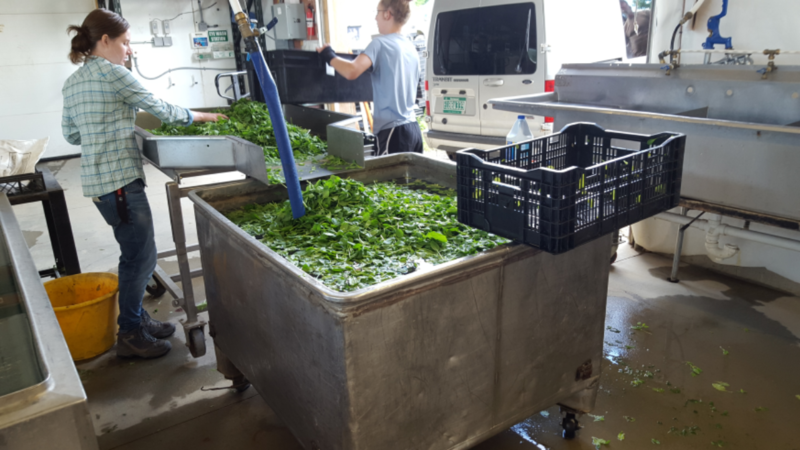 A basket liner is used to scoop greens from a dunk tank, provide an initial drain of wash water and then carry the greens to a spinner. 1-¼ Bushel Mesh Basket – Item #OB125 from Rainflo and others. $15. These are the orange baskets usually with white handles, sometimes referred to as “fish baskets” or “crab baskets” and available from several sources. These are already a mesh and do not require drilling any holes. 20 gallon Rubbermaid Ingredient Container. Item #69020CLWHKIT. Available from Westaurant.com, ULINE, and others. $28-32. Downside is you will need to drill holes for drainage and clean up any rough edges. Rob Rock at UpstreamAg has created a conversion kit that includes a motor controller, (timer and switch) that is “plug and play.” He is also working on a simplified spinner frame assembly as a complete unit to be available for purchase. Electric spinners offer the convenience of being driven by a motor instead of by a person. This frees up labor to focus on other supportive tasks such as washing or packing. The use of a motor also enables control of speed (RPM) and duration of spin cycle. Most electrically driven spinners offer the ability to set a timer or choose a specific spin cycle. These spinners are designed to be cleaned and are made of smooth and cleanable materials such as plastic or stainless steel. Most of these spinners are on wheels with locking casters which allows portability. Some have been designed to with the wheels spread out along a larger radius or with a lower overall height to improve stability. Jericho Settlers Farm utilizes an industrial spinner as part of their wash line and you can see it in action in this video. Disconnect drain unless the drain is needed as part of the cleaning process. When spraying any equipment or parts with water, avoid high-pressure sprayers or other high-velocity water inside the wash/pack area to minimize the potential for cross-contamination from “aerosolization” (projecting tiny water droplets into the air). Remove basket insert, remove any visible dirt, debris, and remaining greens, and wash thoroughly with an appropriate detergent. Consider applying an anti-microbial solution to the insert in accordance with its label. Allow to thoroughly dry. Remove visible dirt, debris and remaining greens from the spinner. Wash all surfaces and places where food or water may contact thoroughly to prevent the build-up of biofilms. Consider applying an anti-microbial solution (a.k.a. sanitizer) in accordance with its label. Allow to thoroughly dry. Document the cleaning date, time and person who did the cleaning. You may also want to apply this SOP prior to washing if the machine is stored outside or in other areas where rodents, birds or other animals could contaminate it. Taylor and Jake of Footprint farm in Starksboro, VT are users of a washing machine conversion. They found that after spinning 30lbs of greens a week, it was both too time-consuming and exhausting for their growing farm. They decided to invest in the course, kit, and a new washing machine to convert into a spinner, and that $600 investment, paid for its self within the 1st week. A downside to the design: It’s loud because the baskets don’t fit perfectly and you can’t close the lid if you keep the handles on the baskets. *Having a lid is nice to close at the end of the day to help keep it clean. Shelf life improvement: Greens can last up to two weeks because they get dried so well. Cleanability: It can be difficult to clean between the drum and the outside of the machine, but when on a concrete floor, it’s fairly easy to spray it out and let it dry. Final Thoughts: Installing a timer improved the workflow, and didn’t require as close attention. One unknown is the longevity of this equipment. So far it has been used consistently for a year and a half with no issues, but its lifespan may be shorter than commercial options. Funding for this publication was made possible, in part, by the Food and Drug Administration through grant PAR-16-137 and Food Safety Outreach Program award 2016-70020-25792 accession 1010528. The views expressed in the written materials or publications and by speakers and moderators do not necessarily reflect the official policies of the U.S. Department of Health and Human Services or the U.S. Department of Agriculture; nor does any mention of trade names, commercial practices, or organization imply endorsement by the United States Government.